For the past five years, I’ve had an annual pizza party for my birthday each January. It’s my excuse to get to cook as many pizzas as possible at one time, to test my pizza-making skills, to try to bring the best I’m able to bring for that year. Last night was the latest, and by my measurements, were the best pizzas I’ve made by far. Here are my notes and recap. I prepped two batches of dough: 6lbs using Trader Joe’s all-purpose flour, and 24oz using Caputo “Tipo 00” imported Italian flour (the standard that the top Neapolitan pizzerias use). 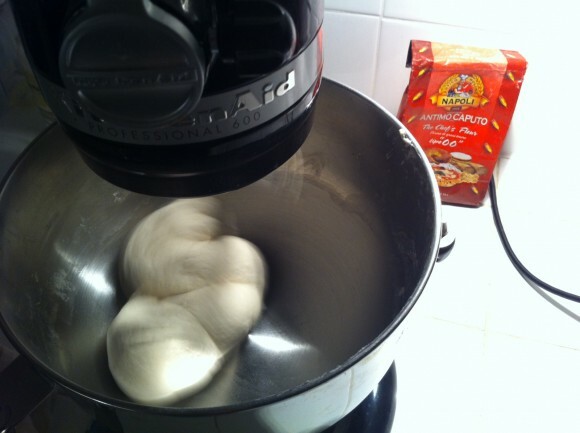 The Trader Joe’s dough was made two days earlier, while the Caputo was made very early the morning of the party. I’ll get to details later, but here’s a spoiler: the Caputo did NOT work well. And as a kick-start, I added a pinch of dry active yeast to the mix (3/4 teaspoon to the Trader Joe’s, 1/4 to the Caputo). I’ve found that the starter yeast takes a bit longer to rise, so this helps make sure things are ready. Otherwise, I might as well just send everyone home. For the dough, I mixed the ingredients in my KitchenAid slowly for 3 minutes, then slightly faster for 10 more. Roughly 10 minute rest, followed by one more 10 minute medium-speed mix cycle. After that, it was put aside to rest and rise (the Trader Joe’s, overnight in the fridge, followed by a full day left out, covered with a damp cloth. It was spilling over the top of the largest bowl I have). 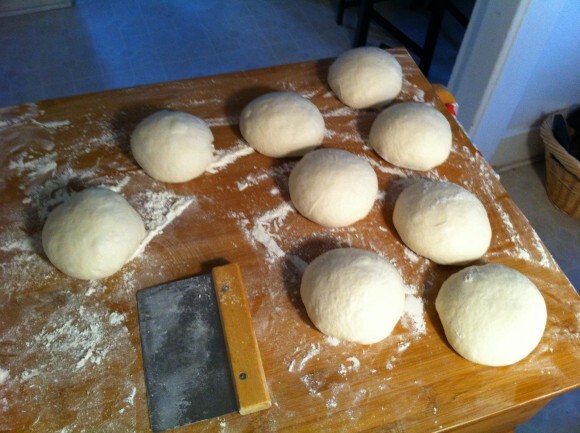 Around noon on the day of the pizza party, I separated the dough into 10.25oz balls. I place these onto a large plastic tray (lightly coated with olive oil). Rolled them to give an even coating of oil, and kept enough space in between for any additional rising to occur. The whole tray was then covered with a dampened towel. This was a new technique that I hadn’t done before, normally the dough balls each get their own small container. I’ll get to this part later too, but I suspect that the damp towel had a very positive effect on the outcome. This was the first year I’ve been able to use the PizzaForge for my party, after having a good trial run at Halloween. The oven was lit with a few large logs in the base of the Weber grill, and left to warm up with a nice chunk on the cooking surface. The fire and heat seemed to move a lot quicker than previous times, perhaps from that second chunk of wood above. In the meantime, I prepped a wide variety of toppings suitable for most everyone, using the plastic containers previously reserved for the dough balls. This was a much better solution, and the lids kept everything clean and tidy while cooking outside. I used the roll-around kitchen cart as a pizza prep station, set up next to the grill. Top drawer contained the plastic tray with the dough, scraper, plus some spices and a small bottle of olive oil. The cabinet below primarily held the bag of flour, but would have been a good spot for the firewood as well, had I thought of that. And my silicone dough mat was a great surface for prepping everything on top. 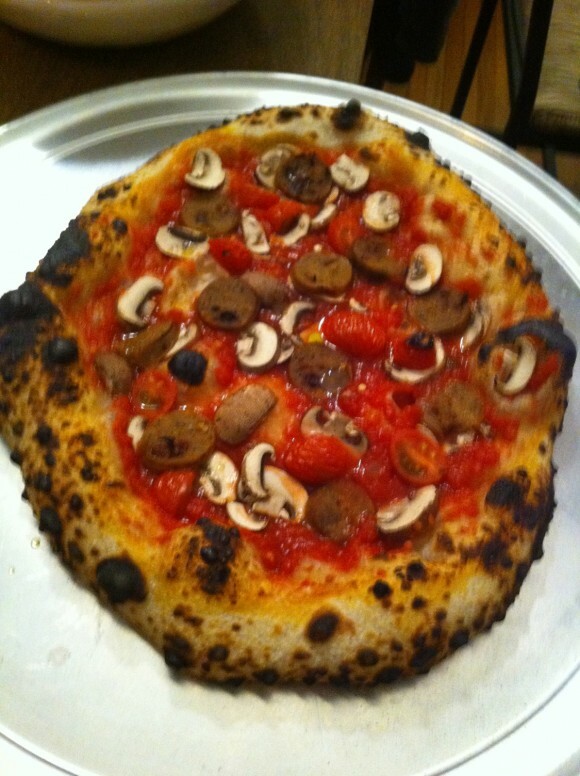 The workflow involved scooping up a dough, pressing it out with a ridge left for the cornicione, topping it with fresh ground tomato sauce (I use Cento brand imported whole tomatoes, which I source from Amazon and grind myself), toppings, then drag the pie onto the peel with two hands. The perforated peel worked like a charm, the pizzas were not sticking at all, and they slid right onto the stone perfectly every time. Results? Amazing. 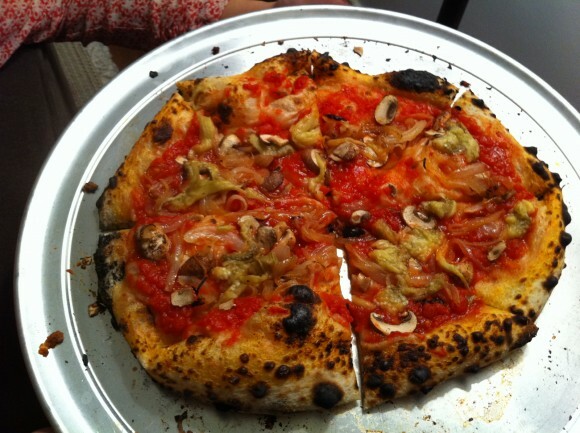 The first pizza, typically a throw-away that is used to gauge the oven’s performance, was possibly the best of the night. I didn’t time it, but it felt like 60 seconds, faster than anything I’ve ever cooked by far. My infrared thermometer was pushed past it’s 900º limit in spots, and seemed to be just below 800º in the cooler areas. 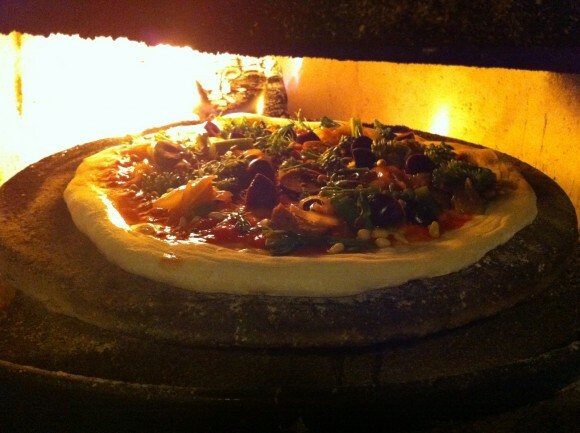 The dough was rising wonderfully and visibly quickly in the superheated oven air, bubbles expanding outwards and charring with deliciousness. I suspect that quite a bit of the dough’s excellent cooking resulted from the suppleness created by the damp towel left on the raw dough. By remaining so supple, the dough expanded much easier as the air pockets inside it cooked and pushed outwards. Result: light, airy crust with a very thin crispy shell around it. Just like I dream of. There were still numerous areas that could use improvement – with the oven firing so nicely, it would have been great to have had a second person helping manage cooking aspect, to keep things moving efficiently (lots of time was lost in the prep phase). Although the doughs were stretched out with very nice roundness, some of the doughs still weren’t evenly thick/thin, and at least one pizza felt a bit undercooked below the sauce (still tasted great though). And finally, the Caputo… I don’t know where it went wrong, but as I began to stretch the dough, holes started to tear in it. I did my best to patch it up, but the worst part came when sliding it onto the peel. The whole pizza tore in half. Somehow I salvaged it, but the end result wasn’t much to write home about. Two tools I now see a need for: the smaller peel used to rotate/remove the pizza (my peel kept colliding with the side of the oven entrance, due to its width), and an oven brush to clean the surface before putting in a pizza. A blower of some sort would be helpful as well, but wasn’t necessary. As a side we made a great lentil salad with cherry tomatoes, a kale salad with cashews, and a homemade vegan “reese’s” peanut butter cup dessert. 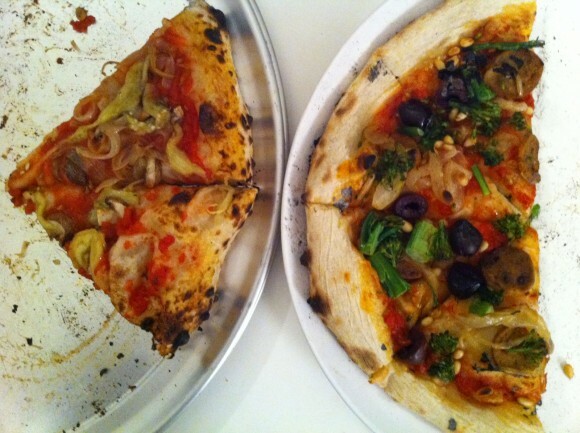 Final pizza is on the right, you can see the difference the lower heat had on the dough.